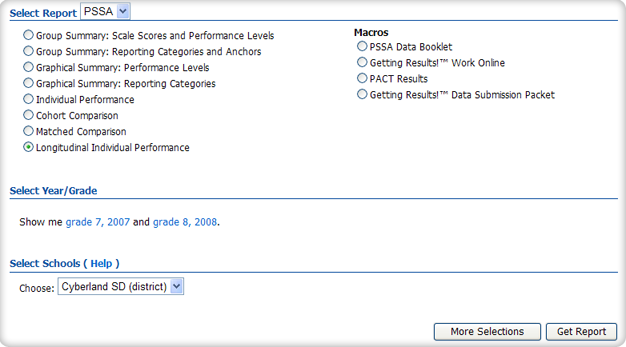 Select "Group Summary: Scale Scores and Performance Levels" under "Select Report." Select state, district(s), and/or school(s). Click "Get Report" to get a report with default selections (you can customize the report later on the report page), or click "More Selections" to customize your report now. 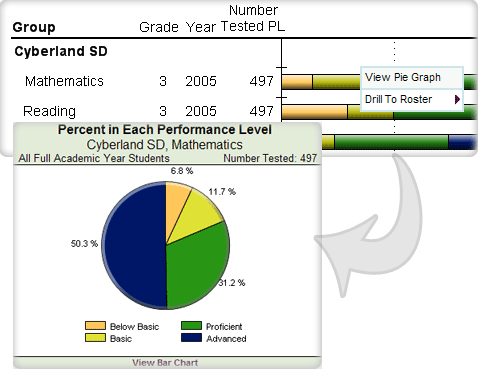 Show N Counts for Percentages: To see, for example, how many students met the standard in Mathematics, click the "% in Each Performance Level" column and then click "Show N Counts." Drill-Down Disaggregation: You can further disaggregate a visible group by clicking on it in the first column. For example, if you see a report for Hispanic females and you would like to analyze those females by their LEP statuses, click on "Hispanic," then "Disaggregate," then "LEP." Drill to Roster: Click on any group or year and select "Drill to Roster" to view the roster of students that comprise the data for that group/year. This feature allows the user to select years. For example, to see scores for the year 2008, click on "2008" and then click "Submit." This feature allows the user to select a grade. For example, to see scores for grade 3, click on "Grade 3" and then on "Submit." 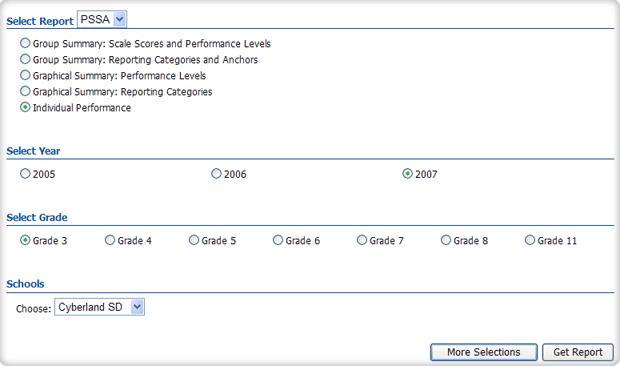 This feature allows the user to select which scores are shown in the report. 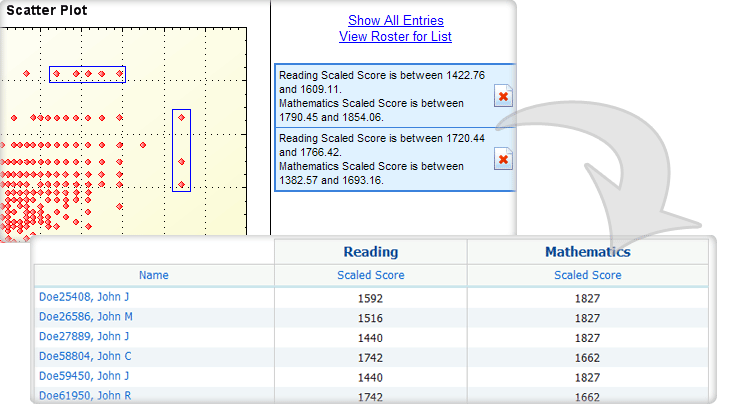 For example, to see the mean scale scores, select "Mean Scale Score" and click "Submit." This feature allows the user to disaggregate the report by different subgroups. For example, to see statistics for different ethnicities, first select "Ethnicity" and then click "Submit." This feature allows the user to include or exclude students based on demographic characteristics. To include one or more subgroups of students, click on the desired subgroup(s) of demographic variables from the drop-down list. Then, click on the word "and" or "or" to specify the logical relationship between the subgroups selected. For example, to view students who are hispanic females, first click on "Female" under gender and "hispanic" under ethnicity, then select "and" for the logical relationship. This will display the scores of students who are hispanic AND female. Using the logical relationship "or" will display the scores for all hispanic students and for all female students, independent of each other. Select "Group Summary: Reporting Categories and Anchors" under "Select Report." Select state, district(s) or school(s). Click "Get Report" to create a report with default selections (you can customize the report later on the report page), or click "More Selections" to customize your report now. Calculate N Counts for Percentages: To see, for example, how many students met the standard in Mathematics, click the "% Advanced/ Proficient" column and then click "Calculate N."
Drill-Down Disaggregation: You can further disaggregate a visible group by clicking on it in the first column. For example, if you see a report for Hispanic males and you would like to analyze those males by their ELL statuses, click on "Hispanic," then "Disaggregate," then "ELL." This feature allows the user to select the year(s). For example, to see scores for the year 2008, first select "2008" and then click "Submit." 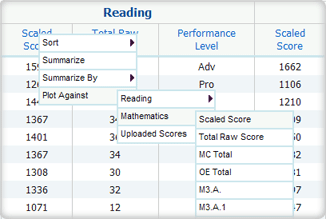 This feature allows the user to select which scores are shown in the report. For example, to see the total raw scores, select "Total Raw Score" and click "Submit." Select "Performance Level Summary Report" under "Select Report." Click "Get Report" to get a report with default selections (you can later customize the report on the report page), or click "More Selections" to customize your report now. 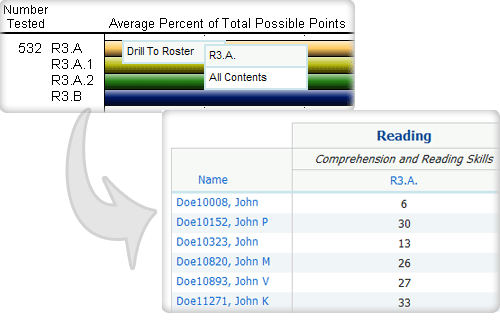 Drill Down to Roster: Click on any bar in the chart to view a roster of the students that comprise the data for that bar. Pie Graph: You can see a pie graph by clicking on a bar and choosing "View Pie Graph." This feature allows the user to select a different report type. This feature allows the user to select different content areas. Select "Graphical Summary: Reporting Categories" under "Select Report." Select the school(s) and/or district(s). Click "Get Report" to create a report with default selections (you can later customize the report on the report page), or click "More Selections" to customize your report now. Once you view your report, you can print it directly from your browser, save it online for later viewing, or download it as a PDF file. 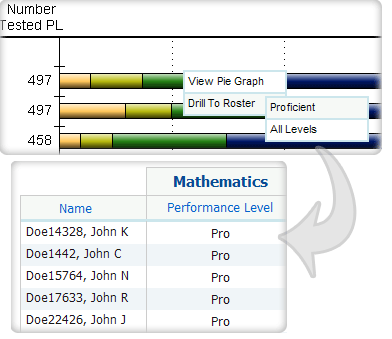 Drill Down to Roster: Click on any bar in the chart to view the roster of students that comprise the data for that bar. This feature allows the user to select one or more reporting categories. Select "Individual Performance" under "Select Report." Select the school or district. View a printable individual report of a particular student by clicking on that student's name. Also, see summary statistics divided into demographic subgroups, such as gender or ethnicity, by clicking on "Summarize By." Generate a frequency distribution for performance levels by clicking on a performance level column and choosing "Distribute." Also, generate a frequency distribution divided into demographic subgroups by clicking on a performance level column and choosing "Distribute By." Create a cross-tab report by clicking on a performance level, choosing "Cross-Tab Report," and clicking on another performance level. This feature allows the user to disaggregate the report by different subgroups. For example, to see results for different ethnicities, select "Ethnicity" and then click "Submit." This feature allows the user to search students by different criteria. For example, to see students with the first name John, select "First Name" from the first drop-down list, type "John" in the input box, and then click "Submit." 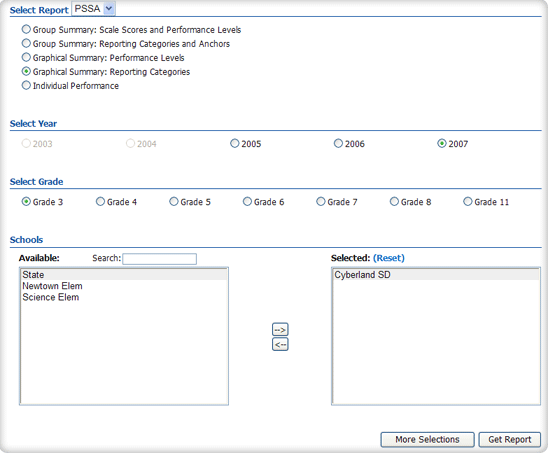 Select "Longitudinal Individual Performance" under "Select Report"
Select the years/grades. The years/grades may already be selected. To make changes, click on the selections (in blue) and the drop-down menus will reappear. Select state, district, or school. Also, see summary statistics divided into demographic subgroups such as gender or ethnicity, by clicking on "Summarize By." Select "Matched Comparison" under "Select Report"
Once you view your report, you can print it directly from your browser. You can also save the report for later online access or download it as a PDF file. This feature allows the user to select which subject should be shown in the report. Select "Cohort Comparison" under "Select Report"
Drill Down Disaggregation: You can further disaggregate a visible group by clicking on any bar in the chart. 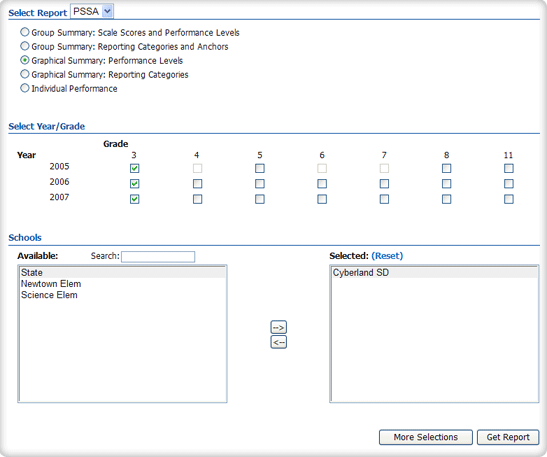 The PSSA Data Booklet can be downloaded as either a PDF or Word file. This report is an overview of your PSSA Reading and Mathematics results for the past three years. 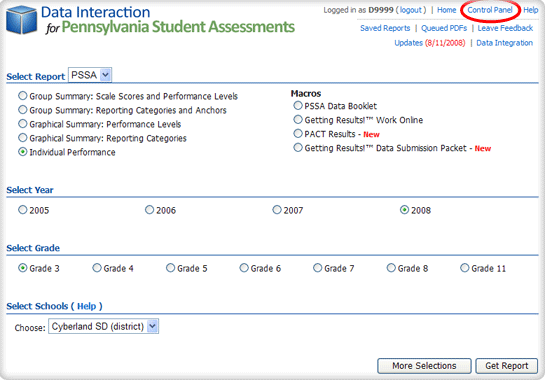 It offers you quick access to easy-to-understand graphical displays of your PSSA results, including disaggregation by student populations, or "subgroups." Getting Results!TM Work Online allows you to choose a bar chart or histogram and the report you would like graphed. It also serves as an interactive "worksheet," where you can create and answer questions right next to the graphical data results. The PACT Results are downloaded as a PDF file. This report is a portrait of your three-year PSSA results broken down into performance level percentages. The Getting Results!TM Data Submission Packet is downloaded as a PDF file. This reports is a portrait of your three-year PSSA results, disaggregated by student populations and reporting categories. Optionally, apply a demographic or search filter to narrow your group of students down. In the Roster Report, click on the score column you would like on the x-axis and then click "Plot Against" and select the other score. Click the button to display a regression line with prediction bands. 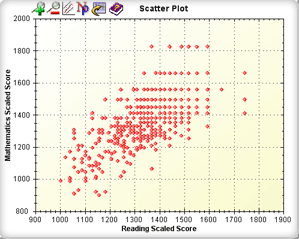 Click the button to display the N-count and correlation coefficient for the scatter plot. Click ONCE on the starting point of your region. Click ONCE on the finishing point of your region. Then, click the button to Zoom in. Clicking the button will zoom back out. Selecting a region of students (see above). Selecting the first region of students (see above). Selecting a subsequent region of students and click on "Add Entry." Repeating step 3 until you have selected your desired regions. To see what you have selected, click on "Show All Entries." To undo or remove a region, click on the button. Clicking on "View Roster for List." 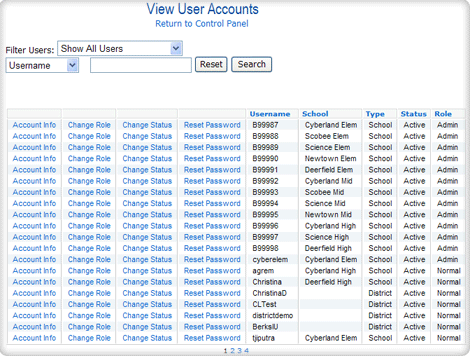 The control panel inside the Data Interaction system allows administrative users to create users accounts with different privileges at the district, school, and content levels. The control panel can be accessed by clicking on "Control Panel" located at the top right of the screen. Please choose an option: "Add User Accounts," "Deactivate User Account," "View User Accounts," or "View User Activity." 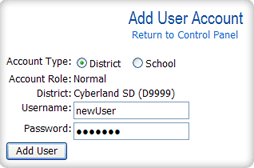 Add user accounts allows for the creation of user accounts for a specific district or school. To create new user accounts, click "Add User Accounts." Select the type of account (see below) and any other additional information that the system asks for. Enter the new username and password and select "Add User." Upload data for data integration. 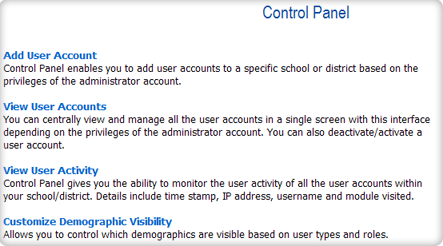 Access the control panel to create, deactivate, modify and view user accounts. District Normal Users have access to all of the data for their specified districts. Access the control panel to create, deactivate, modify, and view user accounts. School Normal Users have access to all of the data for their specified schools. Content Specific Users have access to all the data for their specified contents within their schools. "Deactivate User Accounts" allows an administrative user to activate or deactivate existing user accounts. To deactivate or activate existing user accounts, click "Change Status." "View User Accounts" provides a list of all user accounts and allows for the management of user accounts on a single screen. From the View Users Accounts page, users can view the account information by username, change the role of any account (i.e. administrative or normal), reset passwords, and activate or deactivate user accounts. The list of user accounts can be filtered by using the drop-down box or the search box at the top of the list. To view account information for a particular user, click on the corresponding "Account Info" link. 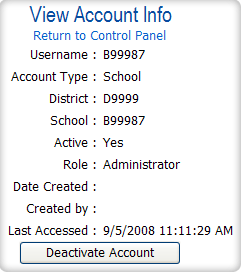 Here you can view the user information and deactivate/activate or delete user accounts. Deactivate User will deactivate the user account. If the account is deactivated by mistake, it can be activated again. Delete User will remove the username from the list of users. The username cannot be used again once it is deleted. Change Role allows the administrative user to change the privileges of a specified account. By clicking on “Change Role,” the user can toggle between administrative or normal for the specified account. Reset Password allows the administrative user to reset passwords for other user accounts. 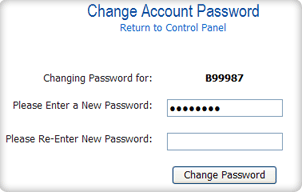 To reset a password, simply type in the same new password in each text box and click "Change Password." Activate/Deactivate allows the status of the account to be toggled between active and inactive. When an account is inactive, the username and password will not provide access into Data Interaction. "View User Activity" displays all user activity within the district or school. Detailed information, such as time stamp, IP address, username, and module visited, is provided. The drop-down box above the table allows for filtering by different time periods. This list can be sorted. "Customize PSSA Demographic Visibility" allows district level administrative users to control which demographics are visible based on user types and roles. Unchecking a checkbox will hide that demographic characteristic from the users with the corresponding user type and role. 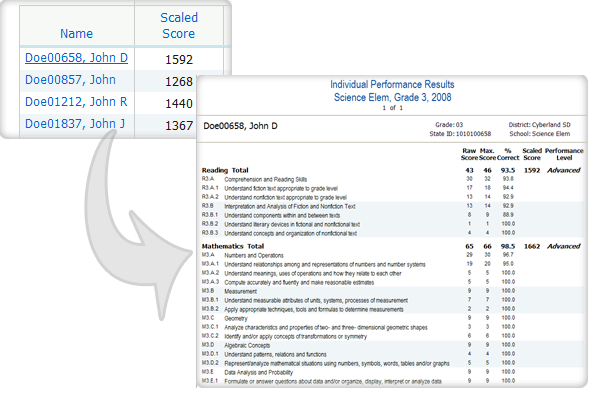 Scale Score - A transformation of the raw score points used to remove the effects of test length and difficulty and to establish a common metric that measures achievement on the academic standards within and across years. Minimum score is 700. Total Raw Score - The number of raw score points received on a test. MC Total - Total raw score for multiple-choice items. An MC item is a type of item where the student has up to four pre-written answers from which he/she must select the most appropriate answer choice. OE Total - Total raw score for open-ended items. An OE item is a type of item that requires students to construct their own written responses rather than choose from a list of pre-written options. Below Basic - The Below Basic Level reflects inadequate academic performance. Below Basic work indicates little understanding and minimal display of the skills included in the Pennsylvania Academic Content Standards. There is a major need for additional instructional opportunities and/or increased student academic commitment to achieve the Proficient Level. Basic - The Basic Level reflects marginal academic performance. Basic work indicates a partial understanding and limited display of the skills included in the Pennsylvania Academic Content Standards. This work is approaching (but has not reached) satisfactory performance. There is a need for additional instructional opportunities and/or increased student academic commitment to achieve the Proficient Level. Proficient - The Proficient Level reflects satisfactory academic performance. Proficient work indicates a solid understanding and adequate display of the skills included in the Pennsylvania Academic Content Standards. Advanced - The Advanced Level reflects superior academic performance. Advanced work indicates an in-depth understanding and exemplary display of the skills included in the Pennsylvania Academic Content Standards. School - School Code (Individual Performance selection menu only). W=White Non-Hispanic, B=Black or African American Non-Hispanic, H=Latino or Hispanic, A=Asian, I=Native American or American Indian, M=Multiracial, U=Unspecified. Migrant - Children of migrant workers (Individual Performance selection menu only); Y=Yes, N=No. Y=Included in score aggregation, N=Excluded from score aggregation. 1 = Title III Served, 2 = Title III Not Served, 3 = Former Title III Served but in the two year monitoring period, blank otherwise. ID - Student identification (Individual Performance selection menu only; district and school level accounts only). DOB - Student date of birth (Individual Performance selection menu only; district and school level accounts only). 01=Traumatic Brain Injury, 02=Hearing Impairment incl Deafness, 04=Specific Learning Disability, 06=Mental Retardation, 09=Orthopedic Impairment, 10=Emotional Disturbance, 11=Speech or Language Impairment, 12=Visual Impairment incl Blindness, 13=Deaf/Blind, 16=Multiple Disabilities, 21=Autism, 22=Other Health Impairment, blank otherwise. Number Tested - Number of students on which school, district or state results are based at each aggregation level. % in Each Performance - The percentage of students at each of the four Performance Levels: Below Basic, Basic, Proficient and Advanced. Total N - Number of students at the school, district, or state level. Valid N - Number of students on which school, district, or state results are based at each aggregation level. Mean - The average of the individual score values. It is calculated for Total Raw Score, Total Scale Score, and Reporting Category Raw Score. Minimum - The minimum of the individual score values. It is calculated for Total Raw Score, Total Scale Score, and Reporting Category Raw Score. Maximum - The maximum of the individual score values. It is calculated for Total Raw Score, Total Scale Score, and Reporting Category Raw Score. S.D. - Standard deviation: the average dispersion of individual scores around the mean. It is calculated for Total Raw Score, Total Scale Score, and Reporting Category Raw Score. Access Levels: There are three levels of access to the PSSA Data Interaction Application: State, District, and School. 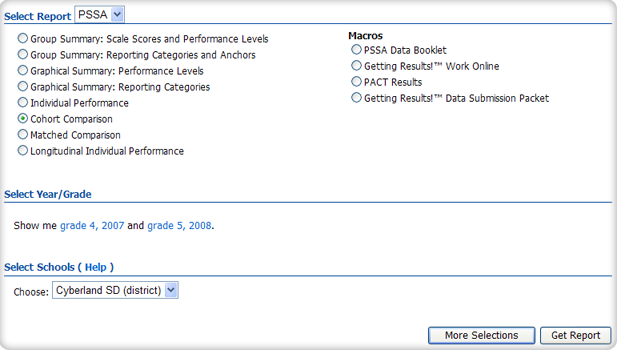 State-level users can view summary results at the state and district levels. They can also view students' scores and other demographic information; however, individual student information, such as names, birthdate, and student ID, are inaccessible. District-level users can view summary and individual results of their own districts and all the schools within their districts as well as the summary results of the state. 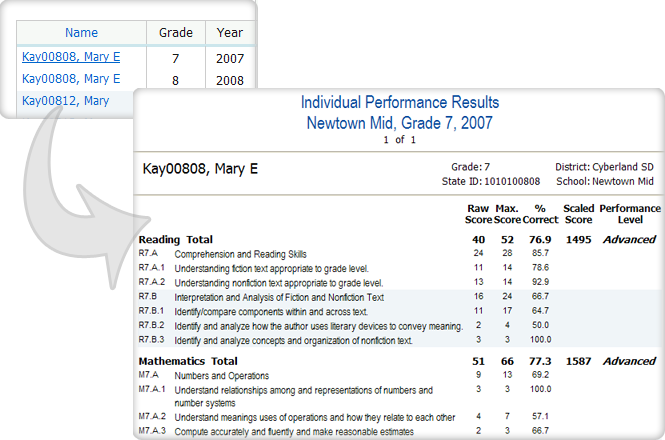 School-level users can view summary and individual results of their own schools as well as the summary results of their districts and the state. 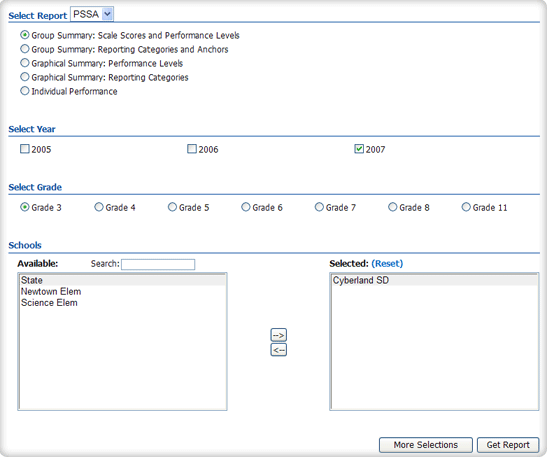 A new access level has been added to the PSSA Data Interaction Application. Intermediate Units (IU) are now able to access their summary results as well as the results of each district in their IU. They can also view students' scores and other demographic information; however, individual student information, such as names, birthdate, and student ID, are inaccessible.